The languages of China are the languages that are spoken in China. The predominant language in China, which is divided into seven major language groups (classified as dialects by the Chinese government for political reasons), is known as Hanyu (simplified Chinese: 汉语; traditional Chinese: 漢語; pinyin: Hànyǔ) and its study is considered a distinct academic discipline in China. Hanyu, or Han language, spans eight primary varieties, that differ from each other morphologically and phonetically to such a degree that they will often be mutually unintelligible, similarly to English and German or Danish. The languages most studied and supported by the state include Chinese, Mongolian, Tibetan, Uyghur and Zhuang. China has 299 living languages listed at Ethnologue. According to the 2010 edition of the Nationalencyklopedin, 955 million out of China's then-population of 1.34 billion spoke some variety of Mandarin Chinese as their first language, accounting for 71% of the country's population. Standard Chinese (known in China as Putonghua), a form of Mandarin Chinese, is the official national spoken language for the mainland and serves as a lingua franca within the Mandarin-speaking regions (and, to a lesser extent, across the other regions of mainland China). Several other autonomous regions have additional official languages. For example, Tibetan has official status within the Tibet Autonomous Region, and Mongolian has official status within Inner Mongolia. Language laws of China do not apply to either Hong Kong or Macau, which have different official languages (Cantonese, English and Portuguese) than the mainland. The Tai–Kadai family: several languages spoken by the Zhuang, the Bouyei, the Dai, the Dong, and the Hlai (Li people). 9 official ethnicities. The Turkic family: Uyghurs, Kazakhs, Salars, etc. 7 official ethnicities. The Mongolic family: Mongols, Dongxiang, and related groups. 6 official ethnicities. The Tungusic family: Manchus (formerly), Hezhe, etc. 5 official ethnicities. The Indo-European family: 2 official ethnicities (the Russians and Tajiks (actually Pamiri people). There is also a heavily Persian-influenced Äynu language spoken by the Äynu people in southwestern Xinjiang who are officially considered Uyghurs. 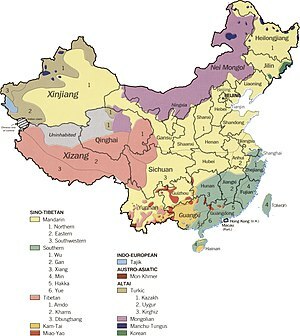 Below are lists of ethnic groups in China by linguistic classification. Ethnicities not on the official PRC list of 56 ethnic groups are italicized. Respective Pinyin transliterations and Chinese characters (both simplified and traditional) are also given. The first page of the astronomy section of the 御製五體清文鑑 Yuzhi Wuti Qing Wenjian. The work contains four terms on each of its pages, arranged in the order of Manchu, Tibetan, Mongolian, Chagatai, and Chinese languages. For the Tibetan, it includes both transliteration and a transcription into the Manchu alphabet. 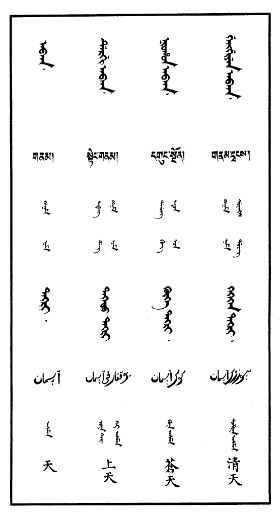 For the Chagatai, it includes a line of transcription into the Manchu alphabet. The reverse of a one jiao note with Chinese (Pinyin) at the top and Mongolian, Tibetan, Uyghur, and Zhuang along the bottom. Ten nationalities who never had a written system have, under the PRC's encouragement, developed phonetic alphabets. According to a government white paper published in early 2005, "by the end of 2003, 22 ethnic minorities in China used 28 written languages." The Chinese language policy in mainland China is heavily influenced by the Soviet nationalities policy and officially encourages the development of standard spoken and written languages for each of the nationalities of China. However, in this schema, Han Chinese are considered a single nationality and the official policy of the People's Republic of China (PRC) treats the different varieties of Chinese differently from the different national languages, even though their differences are as significant as those between the various Romance languages of Europe. While official policies in mainland China encourage the development and use of different orthographies for the national languages and their use in educational and academic settings, realistically speaking it would seem that, as elsewhere in the world, the outlook for minority languages perceived as inferior is grim. The Tibetan Government-in-Exile argue that social pressures and political efforts result in a policy of sinicization and feels that Beijing should promote the Tibetan language more. Because many languages exist in China, they also have problems regarding diglossia. Recently, in terms of Fishman's typology of the relationships between bilingualism and diglossia and his taxonomy of diglossia (Fishman 1978, 1980) in China: more and more minority communities have been evolving from "diglossia without bilingualism" to "bilingualism without diglossia." This could be an implication of mainland China's power expanding. It is also considered increasingly prestigious and useful to have some ability in English, which is a required subject for persons attending university. During the 1950s and 1960s, Russian had some social status among elites in mainland China as the international language of socialism. Japanese is the second most-studied foreign language in China. In the late 1960s, English replaced the position of Russian to become the most important foreign language in China. After the Reform and Opening-up policy in 1988, English is taught in the public schools starting in the third year of primary school, languages other than English are now considered to be "minor languages" (小语种 ; Traditional Chinese:小語種 xiǎo yǔzhǒng) and are only really studied at the university level apart from some special schools which are called Foreign Language Schools in some well-developed cities. Japanese and Korean are not considered as "minor languages" by most of the Chinese people. Russian, French, and German are widely taught in universities and colleges nowadays. In Northeast China, there are many bilingual schools (Mandarin-Japanese; Mandarin-Korean; Mandarin-Russian), in these schools, students learn other languages other than English. The Economist, issue April 12, 2006, reported that up to one fifth of the population is learning English. Gordon Brown, the former British Prime Minister, estimated that the total English-speaking population in China will outnumber the native speakers in the rest of the world in two decades. Literary Arabic is studied by Hui students. Literary Arabic education was promoted in Islamic schools by the Kuomintang when it ruled mainland China. Portuguese is taught in Macau as one of the official languages there and as a center of learning of the language in the region, although use has declined drastically since its transfer from Portugal to the PRC. In Mainland China, English is used as a lingua franca in several fields, including in business settings, and in schools to teach Standard Mandarin to people who are not Chinese citizens. This article incorporates text from Encyclopædia of religion and ethics, Volume 8, by James Hastings, John Alexander Selbie, Louis Herbert Gray, a publication from 1916 now in the public domain in the United States. This article incorporates text from Burma past and present, by Albert Fytche, a publication from 1878 now in the public domain in the United States. ^ a b "English Craze Hits Chinese Language Standards - YaleGlobal Online". yaleglobal.yale.edu. Retrieved 27 July 2018. ^ "Faguowenhua". Faguowenhua.com. Retrieved 27 July 2018. ^ "RI ranks No. 2 in learning Japanese language". The Jakarta Post. Retrieved 27 July 2018. ^ Dwyer, Arienne (2005). The Xinjiang Conflict: Uyghur Identity, Language Policy, and Political Discourse (PDF). Political Studies 15. Washington: East-West Center. pp. 31–32. ISBN 978-1-932728-29-3. Tertiary institutions with instruction in the languages and literatures of the regional minorities (e.g., Xinjiang University) have faculties entitled Hanyu xi ("Languages of China Department") and Hanyu wenxue xi ("Literatures of the Languages of China Department"). ^ Languages of China – from Lewis, M. Paul (ed. ), 2009. Ethnologue: Languages of the World, Sixteenth edition. Dallas, Tex. : SIL International. "The number of individual languages listed for China is 299. " ^ a b Western Yugur is a Turkic language, whereas is Eastern Yugur a Mongolic language. ^ "English beginning to be spoken here". The Economist. 2006-04-12. ^ Stéphane A. Dudoignon; Hisao Komatsu; Yasushi Kosugi (2006). Intellectuals in the modern Islamic world: transmission, transformation, communication. Taylor & Francis. p. 251. ISBN 978-0-415-36835-3. Retrieved 2010-06-28. ^ Wang, Wenpu and Lin Wei (Chengdu Technological University). "Chinese English in as lingua franca in global business setting: A case study of on going emails of a foreign company in China." ICITCE 2015. SHS Web of Conferences 25, 01013 (2016). DOI: 10.1051/shsconf/20162501013. ^ Wang, Danping. "https://link.springer.com/chapter/10.1007/978-94-007-6476-7_8." Language Alternation, Language Choice and Language Encounter in International Tertiary Education, Springer, 2013. pp 161-177. Print ISBN 978-94-007-6475-0. Online ISBN 978-94-007-6476-7. DOI 10.1007/978-94-007-6476-7_8. Published online on 23 May 2013. Ramsey, S. Robert (1987). The Languages of China (illustrated, reprint ed.). N.J.: Princeton University Press. ISBN 978-0691014685. Retrieved 24 April 2014. This page was last edited on 20 April 2019, at 08:53 (UTC).